Allow Out In Jersey to introduce two cats currently residing at Seer Farms in Jackson, NJ, who have experienced their own form of stigma. Despite being delightful, fun, loving animals, Casey and Prince William are sometimes shunned by prospective adopters because they are FIV+ cats. Feline immunodeficiency virus (FIV) has been around essentially as long as HIV. Like its human counterpart, FIV affects the immune system, gradually weakening it and leaving cats more susceptible to opportunistic disease. FIV+ cats, however, can live long, healthy, happy lives. With proper nutrition, monitoring, and veterinary care, they can outlive many of their FIV- cohorts. Often, the only death sentence associated with an FIV+ test result occurs if the decision is made to put an FIV+ cat down simply because it is positive. FIV is not contagious to people or other animal species. FIV is transmitted among cats through blood transfusions and deep, penetrating bite wounds, not through casual contact. Many FIV+ cats are extremely friendly and can make exceptional, loving, companion animals. At Seer Farms, we have several adoptable FIV+ cats who warrant the Out in Jersey readership’s attention. 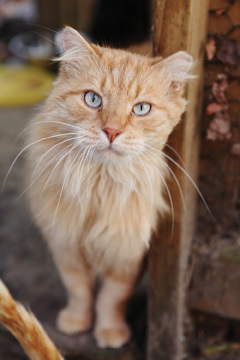 Casey is a hefty, healthy FIV+, long-haired, orange cat. He is just over six years old. He spent the first several years of his life living outside as part of a well-tended feral colony. His spectacular mane was always carefully quaffed and he was always first in line for his meals. 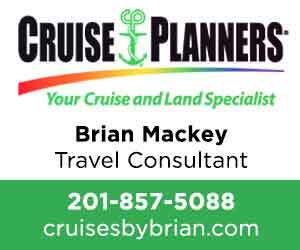 When Hurricane Irene hit the Garden State, he decided his outdoor adventure days were over. He befriended the colony caretaker and convinced her to take him home (can’t we all appreciate that kind of resourcefulness?) and she, in turn, placed him at Seer Farms. Prince William is a handsome, energetic, young FIV+ cat. He has a slender physique, with a lush gray tiger-striped and white coat. Just now a year old, he was born in Brooklyn and has been at Seer Farms for more than half his young life. He does not believe that there is anything wrong with him; he is as playful as can be, always dashing around looking for toys and playmates. Other than his FIV+ status, he is healthy and super sweet. Please forego preconceptions about FIV and come meet these gems yourself. These two are worth the ride. To volunteer, donate, foster or to find out more visit www.seerfarms.org.